Free cancellation 48 hours before check-in. 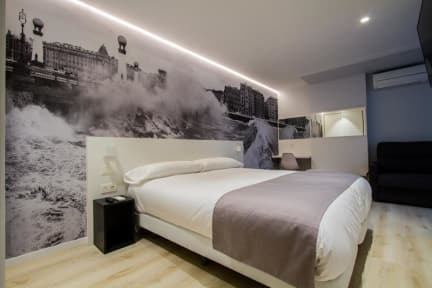 Pension Txingurri offers 15 rooms totally equipped with the latest technology to ensure maximum comfort, all with private bathroom, large closets, flat screen TV, heating / air conditioning and safe. Among the advantages of this establishment is the ease of travel. The bus, with stops just 20 meters from the entrance of the Pension or the bicycle, for lovers of nature and sport, are just some of the options available to comfortably reach the heart of the city. 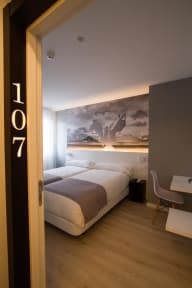 In addition, the Pension offers free WIFI connection for its clients throughout the establishment and has a Bar-Restaurant with non-stop kitchen, free parking and 24-hour care. Located in the town of Astigarraga, capital of the Sidrerías par excellence, the Pension 'Txingurri' stands as a novel and modern concept of lodging to only 6 km from the capital Guipuzcoana of San Sebastián. With regard to the location in the city, we are just five-ten minutes away from the City Council of Astigarraga and Foru Emparantza Plaza. In addition, from our location you can reach diverse bars and restaurants that will bring you the very best of Astigarraga. Rooms Spacious and functional rooms, equipped with a double bed or two single beds. Fully furnished with the best materials, these rooms offer the possibility of staying in a unique and innovative environment and allow the guest to choose between original interior views or exterior views. Whatever the choice, it will be right one. Check out from 08:00 to 12:00. The reception is open from 08.30 to 23.00. But we have a customer service of 24 hours per day.